The Utah Amateur Radio Club meets on the second Thursday of each month except July and August. 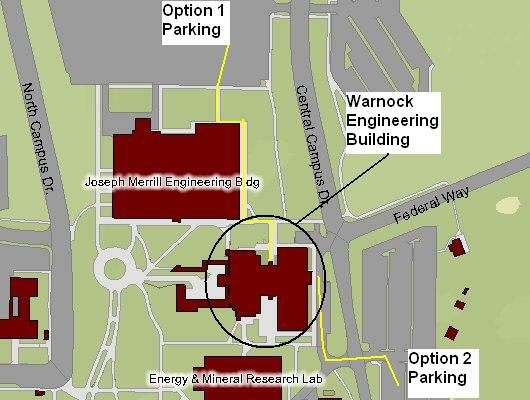 Meeting place is on the University of Utah campus in the John and Marva Warnock Engineering Building, room 2230. From the southeast: Approach the campus by going north on Foothill Boulevard. Turn right onto Mario Capecchi Drive. Move into the left turn lane as you approach and prepare to go under the George S. Eccles 2002 Legacy pedestrian bridge to turn left onto Wasatch Drive. Then turn left at the T-junction onto North Campus Drive. From there go into one of the parking areas as per the map. The building has a central east/west corridor on each floor. On the main floor, walk toward the west end of the central corridor. Room 1230 will be the last room on the right. The yellow line shows how to approach two possible parking areas from either the west, along 100 South, or from the southeast, along Wasatch Drive. 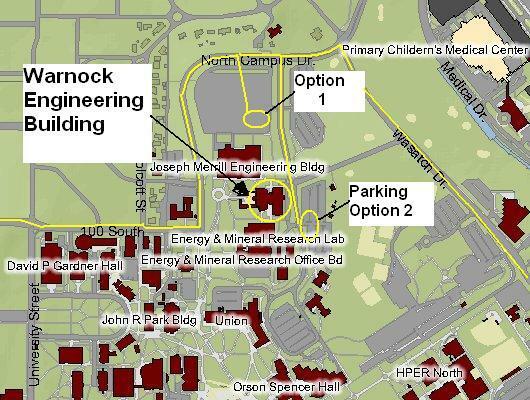 The yellow lines show possible pedestrian routes to get from the parking lots to the Warnock Engineering Building. The drive-through area near the east entrance may be used for dropping off handicapped people.